Vicente Vidal, founded in 1931, is a clear example of a family business that has slowly grown successfully and rationally up until today to become the largest 100% Spanish-capital potato crisp producer at the national level. 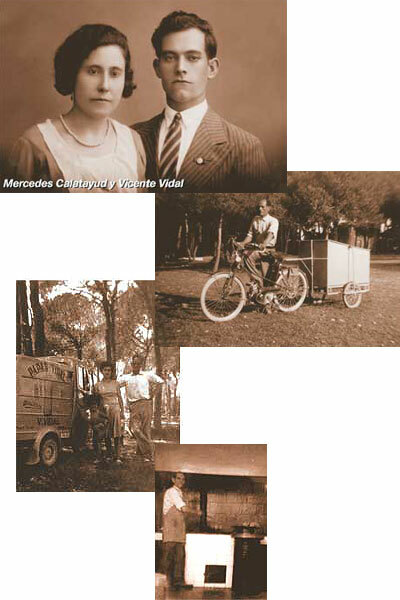 Vicente Vidal began producing churros (a fried dough pastry) and potato crisps in 1931 on the ground floor of the family’s home in Benifaió (Valencia). He would fry the churros and potatoes at five in the morning that he would then sell early in the morning on the streets of this Valencian municipality, combining this activity with his work as a bricklayer and movie theatre doorman. The Civil War temporarily interrupted his activity. Because of the difficulty in obtaining oil to produce his products in the 40s, Vicente had to hide the oil that he transported in wineskins covered with sack cloth. In the 50s and 60s, the business grew little by little with the help of his three sons. His potato crisps also began to be sold in nearby towns (Silla, Sollana, Almusafes…) and reached as far as the capital (Valencia). “My father took potatoes to the best cafeterias of Valencia: Balanza, Luaria, Barrachina… and the people who tried them came back for more”, says Pepe, Vicente Vidal’s youngest son. New facilities were inaugurated in 2001 in Benifaió (Valencia) that occupied 8,000 m2 with a processing capacity of 17 million kilos of potatoes a year. The Vicente Vidal company was acquired by the Aperitivos y Extrusionados company in 2011, and it currently has the most modern industrial plant in the sector, covering 18,000 m2, inaugurated in 2010, where more than 32 million kilos of potatoes are processed every year. Aperitivos y Extrusionados S.A., with its headquarters in Ribaforada (Navarre), is dedicated to manufacturing and marketing snacks, dried fruit, and potato crisps. Some of their most well-known brands are Aspitos, Jojitos, Mooskys, Shiki-Shin, Puntazos, Vicente Vidal potato crisps, MARINAS, and Crisp the World, among others. They mainly market their products in Spain and are present in all marketing channels (Hypermarkets, Supermarkets, the Unorganised sector, and Horeca). What makes our potatoes so special? SINGLE VARIETY POTATOES, with 100% coming from Iberian peninsula fields: “PRODUCTS OF OUR LAND”. We produce natural products in the traditional way. We buy our potatoes directly from the farmers, and that way we guarantee the profitability and sustainability of Spanish crops. We monitor and take the greatest care with our raw materials: we select the best potato seeds for the soil we are going to work and we monitor the crops from seed to harvest. We combine them with the best ingredients so that the final product is an excellent example of the Traditional Recipe from 1931. We provide uniform quality throughout the year. And this only happens at Vicente Vidal. No other potato crisp brand does everything we do. That’s why Vicente Vidal potato crisps ARE UNIQUE! !